New album release by the HSBC Laureates of the Académie on 22 February: "Die Schöne Magelone", a love story told in 15 Brahms' lieder. The Académie du Festival d’Aix and the Alpha Classics label – with the support of HSBC France – are continuing their collaboration to enable the Académie's HSBC Laureates to record an album. This is a great opportunity for these young talents to make themselves known to a wider audience. By investing in these new talents, the Alpha Classics label is making a commitment to supporting demanding, ambitious artistic projects that frequently go off the beaten track. For this fifth album, baritone John Chest, 2015 HSBC Laureate of the Académie du Festival d'Aix, and pianist Marcelo Amaral perform Die Schöne Magelone by Johannes Brahms. Of all the rich lieder output composed by Brahms, The Romances of Maguelone by Ludwig Tieck op. 33 (1869) – also known as The Beautiful Maguelone – is the only true cycle. The German composer set to music fifteen of the eighteen romances in Ludwig Tieck's novel, entitled The Love Story of the Beautiful Maguelone and Count Pierre of Provence and published in 1797. The work is representative of German romanticism's typically poetic and idealised reinvention of the Middle Ages. It tells the story of the frustrated love affair between the knight and troubadour Pierre of Provence and the beautiful Neapolitan Princess Maguelone, who are on opposite sides of the Mediterranean; romantic adventures resulting in a happy ending. Deploying the full extent of his genius in melody and rhythm, Brahms adapted the style of his ballads to the wide variety of forms and atmospheres in the text which he put to music. The medieval era is suggested by a few archaising effects, chorales and imitations of the lute or Pierre's horse rides. John Chest and Marcelo Amaral presented this musical programme at the Festival d'Aix in summer 2017 and continue to perform it on tour. Recent shows include the Wigmore Hall in London in 2018 and the Opéra de Lille last January. It is especially the epic scale of the cycle – a real pocket opera supported by a piano score of great complexity – that strikes the listener. The poetic world of Maia Flore – 2015 HSBC Laureate of the Photography Award – once more graces the cover of the Académie du Festival d'Aix HSBC Laureates' record. One of her original creations had already been used to illustrate the previous opus in the series, Black is the colour. 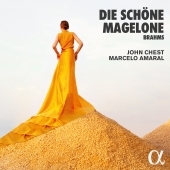 Listen, buy and download "Die schöne Magelone"